Is it the last weekend in November already? Where is 2016 going?! It's been a busy month for me - personally, professionally, runningly (yes, I realize I completely made that word up). However, most of that activity was loaded into the first half of the month and so I've spent most of the back half recovering. Which leads to my monthly runfessions! 1. I runfess that I've been bad this Black Friday. I'm trying not to think about the money I've spent in the last 24 hours. The good news is that I have nearly ALL of my Christmas shopping done. On the flip side, I've bought more for me than I usually do, which makes me feel (probably unnecessarily) guilty. Am I excited about all of these things? Yes. Did I get a fantastic deal on all of these things? Again, yes. Do I work hard to make the money I spent on these things? You better believe it. I'll have to figure out how to let it go! 2. I runfess that I've been trigger shy on a couple of races (which is definitely not like me). I think the biggest reason is that I don't have anyone - yet - to run with me and races just aren't as much fun for me without the social element. 3. I runfess that I have felt like a running slacker lately. I'm still recovering from the New York City Marathon, but I'm starting to feel a little anxiety about being really prepared for the Disney Princess Half Marathon (I'm doing the 5k, 10k, and Half Marathon). I usually don't do a hard-line training plan unless we're talking about a marathon, but I do believe that I need to get a little more on the band wagon or else I'll risk getting off of my routine. 4. I runfess that I'm behind on the blog. Hopefully I've been keeping up reading and commenting on your awesome entries, but I've not been writing enough of my own. I'll get back on it - promise! 5. I runfess that I'm still not adjusted to these winter hours. I love sleep and I'm really good at it (I'm talking 8-9 hours a night), but these short days are messing with me. It feels like the older I get, the harder it is for me to adjust to changes in time - daylight savings, different time zones when traveling, etc. Who knew my body and brain were so change averse?! 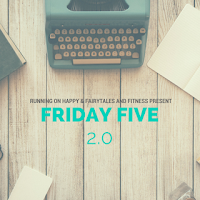 I'm linking up with Marcia's Healthy Slice for Runfessions as well as Fairy Tales and Fitness and Running on Happy for the Friday Five 2.0. Check them out! What's your favorite running "splurge?" What's the next race you're really excited about? I have had a hard time adjusting to this time change too and feel like I am not getting enough sleep either. I recently bought melatonin and that has helped a lot. Luckily I have refrained from buying things for myself on Black Friday. It is so tempting though with all those sales. You are so much stronger than me! I'm impressed! Still feeling so much guilt ... but also really excited to get my new stuff :) I may have to pick up some melatonin. My Sleepy Time tea is just not getting me all the way there. Thanks again for being great hostesses! Black Friday was fairly uneventful (spending-wise) this year. Not much (from the ads)grabbed my attention, so we didn't head out until mid-morning on Friday. The crowds were manageable, and we still found some decent bargains (yes, I really DID need those new running tights LOL). Thank you for making me feel better about all of my purchases! I'm pretty sure your husband may even appreciate having some of his shopping for you done already :) That sounds like a win-win to me! I feel like a running slacker too. I have been running once, maybe twice a week since the marathon. I think my body needed a break though. I just have NOT been motivated to get up and run in the cold, zero dark thirty hours of the morning. But I have been doing other things, so not feeling (too) guilty. Wasn't NY great ? It was so great! Maybe that's part of why it's hard to get back in the swing of things. I have to admit that it makes me feel a little better that it's not just me :) And you're right, the cold and dark isn't exactly inspiring! I feel bad for spending so much money yesterday too. Its hard to say no to a really good deal! I always feel guilty after spending money. I think it's something hardwired in my brain. I haven't hit up Amazon yet, but plan to at some point this weekend. You could have run Disney with me in January!! After that I'll do all half marathons within a 90 mile radius. There are quite a few. I runfess, I'm behind on blogging too. I definitely thought about Disney, I just didn't feel quite as good after running NYC as you did Chicago and wasn't sure about another marathon so soon. That's pretty awesome accomplishment to have done all those half marathon. Have you done a post about that? I'd love to know your favorites and the ones you go back to! I'm fine with Daylight Savings, but it's standard time that makes me want to hibernate. It's dark for so long in the evenings, my body clock starts thinking it's time to go to bed, and it's not. I definitely love the sunlight in the summer evenings. Oh I love that too! Those days where it's 9 PM and you look outside and it's still light .... ah, I miss that! This dark when you leave for work and dark when you leave work to come home is just not cool!